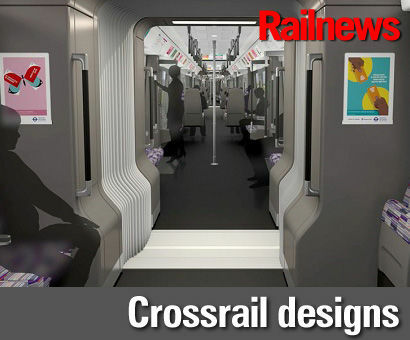 THE interiors of the new fleet of trains for Crossrail which are being built by Bombardier in Derby have been unveiled by Transport for London. The light-weight trains follow recent TfL practice for Underground S-Stock and Overground Electrostars by being walk-though. They should use almost a third less electricity than older trains but also provide faster journeys. TfL said each nine-car train will be more than 200m long, or roughly one and a half times the length of a typical Underground train. Each full Crossrail set will have capacity for 1,500 passengers, who will be able to use 4G and WiFi on board. The first examples will enter service between Liverpool Street and Shenfield in May 2017, although TfL said the initial fleet for this route will consist of seven-car sets, while the nine-car versions are due to start running between Paddington and Heathrow in May 2018. By the end of 2019, the original seven-car sets will also have been lengthened to nine cars. TfL said its new trains have an interior design and colour palette which has been carefully selected to be accessible and welcoming. The design includes darker floors and natural finish materials that will wear in s and rather than wear out, so they retain a 'high-quality feel' for years to come. The light coloured ceilings are intended to encourage an impression of 'height and openness' inside. The materials and colour palette will also be aligned with the colours used on the stations, to give a feeling of consistency. Each train will have four wheelchair spaces and some seats will tip up, to make room for luggage. Rail minister Claire Perry said she was looking forward to seeing the first trains completed in Derby next year. The contract to build 600 cars will be supporting 760 jobs and 80 apprenticeships. Peter Doolin, who is Bombardier Transportation’s vice president for projects, said: “Bombardier is delighted to be working with TfL in designing, manufacturing and testing these iconic new trains for London – all done right here in the UK. The new Crossrail trains are based on our very latest Aventra platform, which has proudly been designed and developed as a technology leading train for the UK. We look forward to continuing to work together with TfL on this flagship project to deliver these new trains for London”. Crossrail services between Reading and Heathrow in the west and Shenfield and Abbey Wood in the east are expected to carry some four million passengers each week when the network is fully open in 2019.